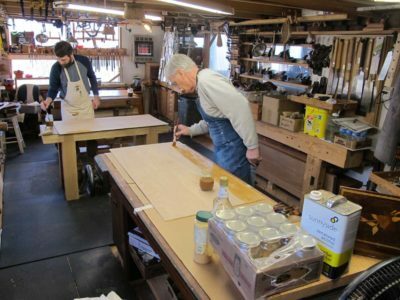 Recently I hosted my almost-annual three-day Historic Woodfinishing workshop at The Barn. Due to family medical emergencies three of the five registrants were unable to attend. This, combined with some seasonably chilly weather (holding this the final weekend of April was an experiment that will not be replicated), led me to relocate the event into my heated workshop rather than the unheated classroom space. That actually added to the intimate atmosphere of the session. My syllabus for this workshop is pretty well established after this many iterations. 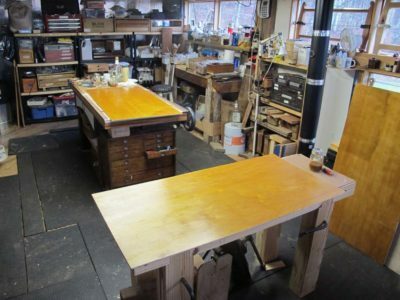 Given the brevity of the schedule I restrict it to only two major finish materials, shellac and wax. Next year I am penciled in to teach a longer workshop at MASW so we can explore the topic more broadly, but for now this is what we cover. As always my objectives are to 1) present finishing as a structured enterprise, to familiarize the participants with my approach to finishing and remove any hurdles of intimidation, and 2) provide some hands-on/muscle memory experiences to impart confidence for once they are back home. 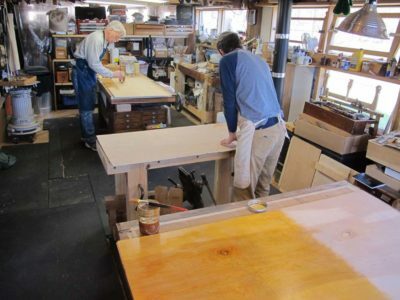 One of the foundational exercises is to brush shellac spirit varnish on a 24″ x 48″ plywood panel that is straight from the bin at the lumber yard with only the most cursory preparations of sanding with 220 paper for a coupe minutes. 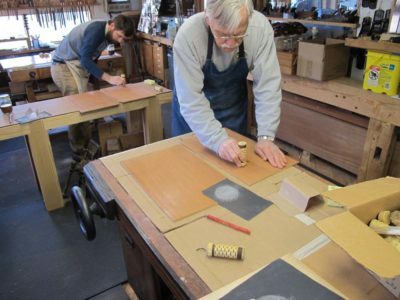 The objective is to build up enough finish in three sessions, two on Day 1 and one on Day 2, to provide a great base or polishing out on Day 3. 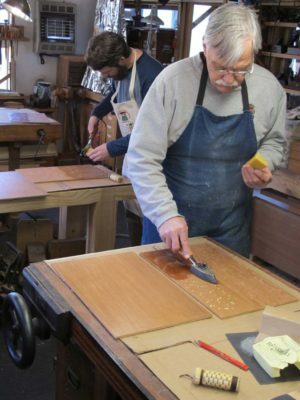 Each of the three sessions results in about a half dozen applications of varnish. In between the first two application sessions on Day 1, the dried varnish is lightly rubbed with dry pumice to remove and nits that are there. 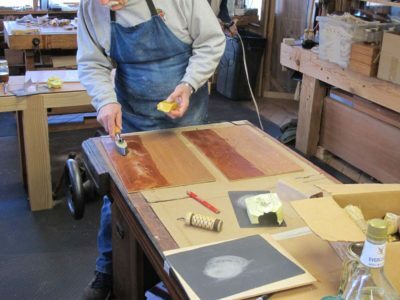 Other Day 1 exercises include burnishing a mahogany panel with a polissoir, with a polissoir and wax, and applying a layer of molten wax to fill the grain and serve as a final coating. Thus endeth Day 1. Now on to Day 2. Why just pictures of the old man?